I recently enjoyed a trip to South America, visiting the countries of Argentina, Uruguay and Chile. In addition to using my rudimentary Spanish and seeing llamas, penguins and other exotic creatures, I also learned about the most common use of the gourd in this part of the world. However, you shouldn't ask about "gourds" while traveling in Argentina; "calabazo" is the correct term in South America. 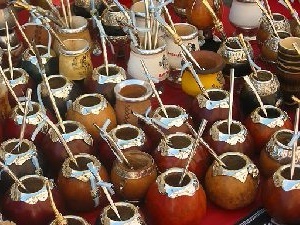 Gourd mate cups (pronounced "ma-teh") are widely used to drink a tea made from the yerba plant; both the drink itself and the gourd cup are known synonymously as mate. (The word "mate" should not be confused with the Spanish word maté, which means “I killed”.) 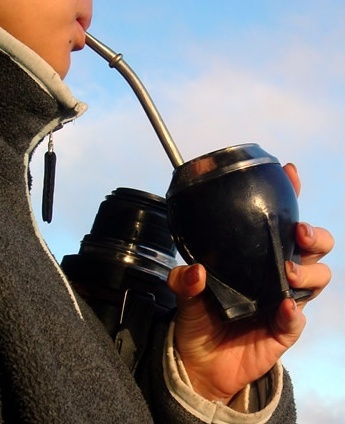 Yerba mate is the national drink of both Argentina and Uruguay, and the use of yerba mate is widespread in Paraguay and southern Brazil. A slightly different mate mixture is used in Bolivia and Peru. The word yerba literally translates as "herb", but that term is a misnomer. The yerba plant (Ilex paraguarensis) is a tropical or subtropical evergreen tree of the holly family that requires high humidity, temperature and rainfall. The tree reaches maturity in about 25 years and can reach heights of over 40 feet. The wild yerba plant is indigenous to Paraguay, Brazil, Argentina, and Uruguay, and is prized as an organic tea. However, the plant is now commonly grown on plantations in many other tropical countries to meet the high demand for the product. Yerba leaves are dried and used as a type of infusion similar to tea, but the yerba mixture is usually prepared in a much stronger concentration using small amounts of water. Nutritional analysis labels show that yerba is high in vitamins B-1, B-2, A, riboflavin, carotene, pantothenic acid, and many types of amino acids, as well as iron, zinc, potassium, magnesium and other trace minerals. It also contains anti-oxidants and a substance similar to caffeine. Yerba use is associated with the lowering of blood pressure and acts as a diuretic and a mild laxative, and advocates claim many other health benefits as well. Yerba mate is prepared differently from regular teas. Akin to English tea time or Japanese tea rituals, drinking and preparing yerba mate is somewhat ritualistic and different people will profess strong opinions on the exact method of preparation for best flavor and ideal results. 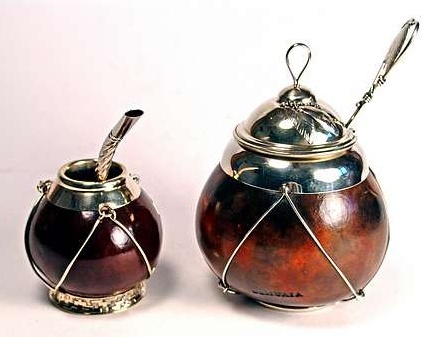 In a typical preparation, the gourd mate cup is filled about three-quarters full with loose yerba, and then tilted so the yerba is lowered on one side. 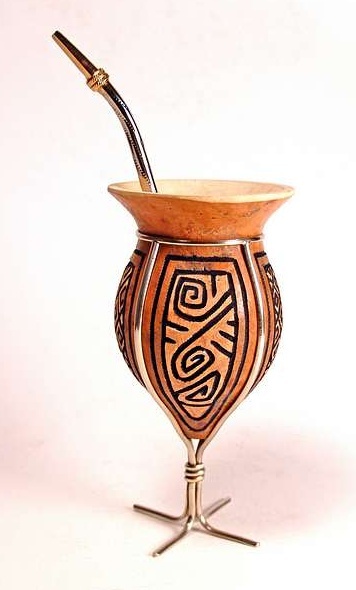 A small amount of cold water is poured into the cup along the side where the yerba is lowest, and the mixture is allowed to sit for a minute. A bombilla (pronounced bom-bee-ya or bom-bee-zha depending on local accent) straw is inserted fully into the prepared cup. Additional hot water is added as the leaves absorb the moisture, and a froth will appear on the surface of the yerba. The first sips of the tea are the most bitter and are sometimes discarded. Purists prefer the natural or "bitter" drink, while others add sugar or honey to the mixture so the tea is sweetened. The water is never heated to boiling, but is used at a slightly lower temperature of about 160–180 degrees Fahrenheit. Thermos bottles are used to carry water of the correct temperature which is used to replenish the cup periodically. The use of yerba mate is so common, that water of the correct temperature is often available at gas stations and other locations. It is a typical sight to see someone walking along the street, mate in hand and a thermos slung over their shoulder. The mixture is drunk a sip at a time until the cup is emptied, then additional hot water is added. The yerba mixture is reused until the flavor is gone from the infusion. Drinking yerba mate is often an intimate ritual. Friends will share a cup and bombilla and pass the cup among them. Because all participants share the same bombilla, it is a sign of close friendship or intimacy to enjoy a mate friendship. Mate gourds can be simple or elaborate! Left: A Buenos Aires artisan carves a gourd mate for me while I wait! Here are some examples that I brought home from my travels. The 4 pieces below are similarly decorated with alpaca wire, banding and rims. Packaged yerba is sold loose or in tea bags. These and other products including mate gourds are available through Amazon by clicking on one of these images. There are a variety of filters pictured here, including spoon shape, coiled spring, pierced ball and small slots. The two brown bombillas are made from cane, and the silver piece on the far right is the sugar spoon from the sugar bowl pictured above. 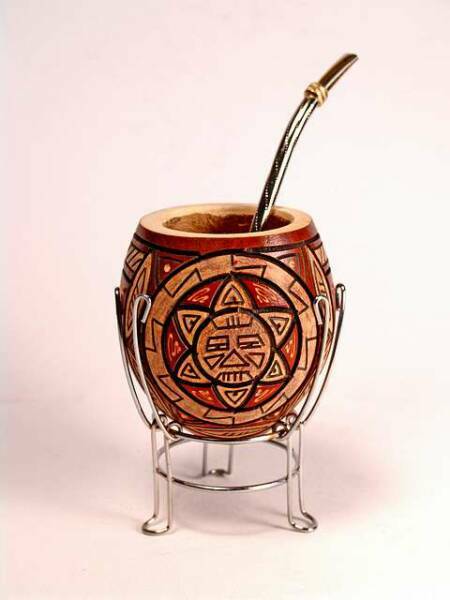 Yerba mate has a strong flavor, and is something of an acquired taste. As with beverages such as coffee or scotch, what may taste unappealing at the first sip may eventually become a favored drink. People in South American countries often grow up drinking a milk diluted or sweetened mixture as a child and become as attached to the caffeine and flavor as many Americans are of coffee or colas. The yerba tea mixture has a taste something like green tea with tobacco overtones. While some people love the taste, one person described it to me as "drinking grass clippings through a cigar"! Drinking diluted yerba made from yerba tea bags or adding sugar to the tea may be more palatable to the North American novice than strongly infused tea. Before its first use, a gourd mate must be cured. The flavor of the mate improves as time goes by and it continues to cure. The first step is to eliminate the soft pulp from of the inner walls of the gourd. 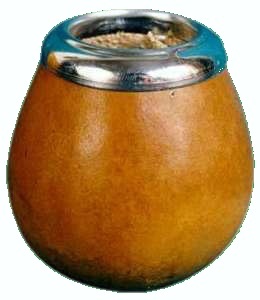 The gourd is filled with wet, used yerba pulp, taken from a mate in use. Hot water is added, and the gourd is set aside to rest for a day. The next day, the used yerba is removed and the gourd is well rinsed. Then the inner walls are scraped to remove the soft inner pulp. Once this process has been finished, the gourd is rinsed again with plenty of water and the operation is repeated a few times. If the gourd is going to be used to drink a sweetened yerba mixture, the wet inner walls of the gourd can be coated with sugar, and a hot ember added. The smoke and burning sugar will drive the sweetness into the wall of the gourd and add additional flavor. Mates range from simple, small, and unadorned gourds to elaborately carved cups complete with silver accents or leather coverings. Each region has different designs and decorations. Antique mate cups are highly prized, with the mate and bombilla often becoming valuable family treasures that are handed down among generations. 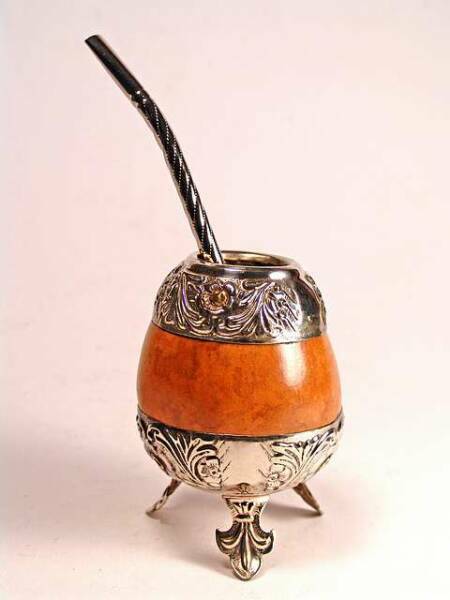 Mate gourds from Uruguay may have intricate carvings or leather cup holders, while those from Argentina are often decorated with Alpaca (German or nickel silver). Some mates have a three-legged metal base so the gourd will stand alone, and many have a metal ring around the hole in the top to reduce wear. 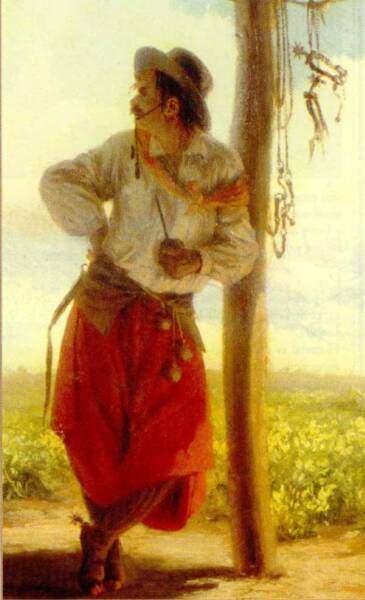 The decoration of a mate is somewhat regional but also depends on whether the gourd is intended as an artistic piece or one that is solely functional. The shape of the gourd also varies by region, with some preferring a gourd with a narrow (or wide) opening or a specific bowl shape. Gourds that have thick walls are valued due to their sturdiness and because they are less likely to crack with long usage. Gourd mates may be decorated with aluminum, resin or leather coatings, and some are even covered with an entire cow hoof! While many people swear by the flavor that is imparted from a natural gourd, some mates are also made from wood, ceramic, cow horns or steel. Prices vary widely from a few dollars to several hundred, depending on the materials used to decorate the mate and the artistic value. Bombilla literally means "light bulb". This name originated from the shape of the bombilla; many of these straws have a flared or bulbous end which acts as a filter as the mixture is sipped. These decorative metal or cane straws have some type of coiled spring, small slots or pierced holes that prevent the minced yerba leaves from being ingested. The highest quality bombillas are made from silver and have a gold tip, but inexpensive cane bombillas are just as functional. Some bombillas are easily disassembled for cleaning; a small bottle brush type accessory is used to clean the interior. Sugar bowls and yerba storage containers are also made from gourds and are sometimes available with mates as matching sets. It was difficult to find someone that could tell me exactly what gourd variety was grown and used for mate cups. When asked, the locals just spoke vaguely about the "pumpkin" or occasionally referred to them as squash. The word gourd is not used in South America, instead, calabaza is generally used to refer to any variety of squash, gourd or pumpkin.